St Charles' School (or Orphanage) for Roman Catholic Boys was established in around 1884 at Brentwood, Essex. It received pauper boys who would otherwise be in workhouse accommodation. In 1897, the School could house up to 200 boys aged from 7 upwards, with a payment of 6s. a week. requested. It was then run by the Christian Brothers, in the charge of Brother Arthur Doyle. By 1907, the Daughters of Charity of St Vincent de Paul managed the School and its intake now included boys from the age of two upwards. 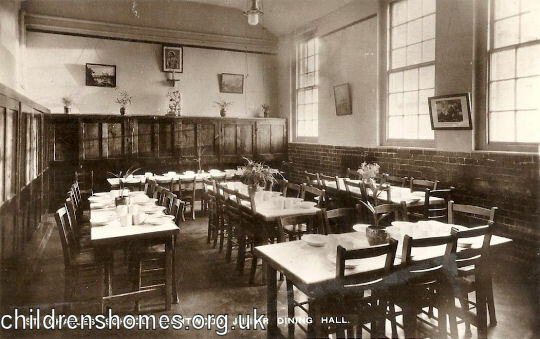 Dining-room interior, St Charles School, Btrentwood, c.1910. The School was closed in 1954 and the site sold to the Home Office. The buildings no longer exist. Catholic Children's Society (Westminster), [formerly the Crusade of Rescue] 73 St Charles Square, London W10 6EJ. To enquire about access to the records of a child who grew up in one of the Society's homes, fill in the request form on the Society's website. Has records 1902-1938.